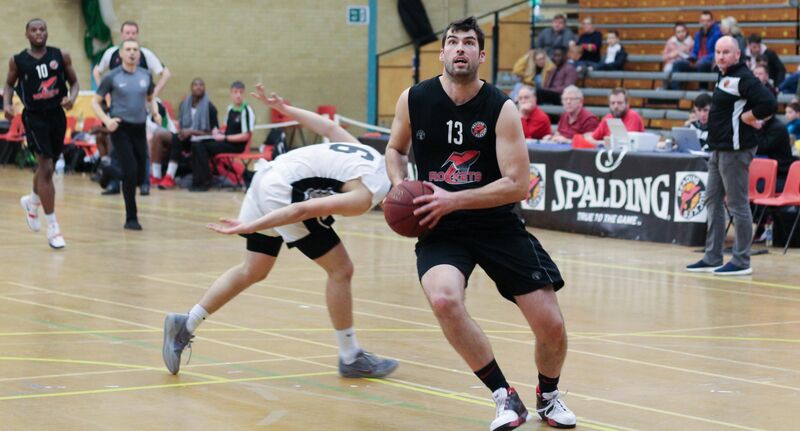 Loughborough Riders 83 v 63 Reading Rockets. In the Playoff Championship quarter final, despite a good and encouraging first half, Rockets couldn’t contain Riders as they stormed the third period 22-10 thanks in principle to outstanding treble shooting. Riders hit five in this quarter and defended stoutly to take a double digit lead into the final stanza, which they edged to take their place in the semi-final stage next weekend. In the 2 league games Rockets had the head to head as each team won their home game but at the semi-final stage of the National Trophy in January, Riders lifted their game to win and go on and take the Cup. Rockets were quick out of the blocks at the University but A J Carr was a little too enthusiastic as he was called for a pair of fouls inside the opening two minutes of early exchanges, meaning Head Coach Alan Keane had to bring him off court . Captain Danny Carter ( in what was to be his last ever appearance in a Rockets vest ) worked tirelessly inside, took down rebounds and made key assists whilst Sydney Donaldson again proved the heart of the team seeing Rockets to a 19-14 advantage at the first break. The second quarter was a much lower scoring affair as both defences stayed on top though Riders took the lead for just 50 seconds before the interval before Carter saw Rockets go the locker room 31-30 ahead. The third period was a tough one for Rockets as Riders hit five from beyond the arc compared to just one in the whole of the first 2 periods as they took the quarter 22-10. Carter, Donaldson and Trae Pemberton were the only Rockets scorers as Riders stepped up their already good defence. 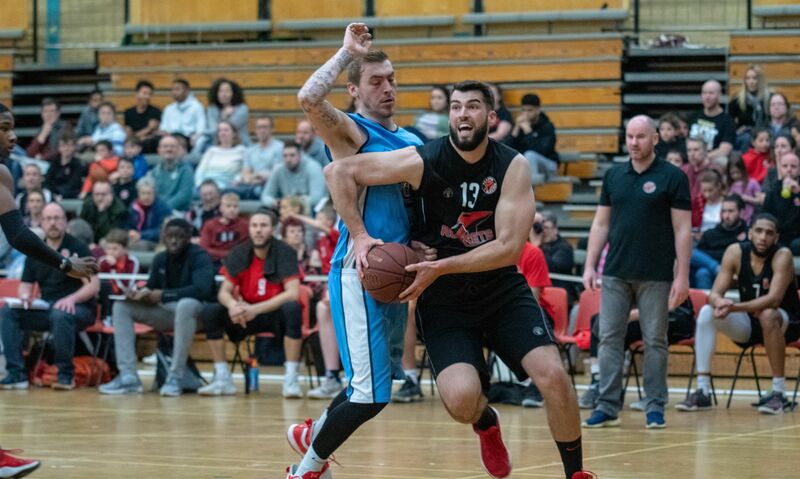 Despite a David Chive rejection with less than two minutes remaining of the third quarter, Riders stroked a brace of trebles, the last one on the buzzer and giving Riders a big boost and an eleven point lead at 52–41. A Pemberton effort came back out of the ring at the start of the final quarter before Carr hit his only treble of the afternoon to reduce the deficit. When Carter went inside to score, Rockets found themselves just seven points down inside two minutes. A very tough call with just one second left on the shot clock proved disappointing and costly for Rockets as Riders were secure from the free throw line and hit a pair of trebles to take a fifteen point lead at 64-49 mid way through the quarter. Carter shone throughout the game but especially in the final period as he worked ferociously to take Rockets to the semi-final stage as he poured in ten personal points, drove hard drawing fouls but Rockets just couldn’t find a way of stopping the rampaging Riders. Adrian O’Sullivan hit two trebles to reduce the deficit to just ten points at 63-73 with two minutes remaining but with Rockets needing to stop the clock to regain possession, Riders were frequent visitors to the penalty stripe from which they only missed one whilst Rockets’ treble efforts were unsuccessful as Riders took the quarter final 83-63 with a 10-0 run. Top scorers for Rockets were Danny Carter with 19 points, 5 rebounds and 2 assists with Sydney Donaldson hitting 14 points and taking down 7 rebounds. Adrian O’Sullivan and A J Carr hit 8 points each with Trae Pemberton and Arinze Emeka-Anyakwo scoring 7 each. In a most unusual Play-off Championship draw both Rockets Men and Ladies found themselves playing Loughborough away on the same day so they travelled together bringing encouragement to each other with Ladies taking the moral win though Riders went to the semi-final stage with a narrow margin of just five points. From a 3-14 deficit Rockets got within five points midway through the final quarter and into the last 1 minute 17 secs but a very contentious refereeing call saw Rockets top scorer being called for an unsportsmanlike foul and having to leave the court. 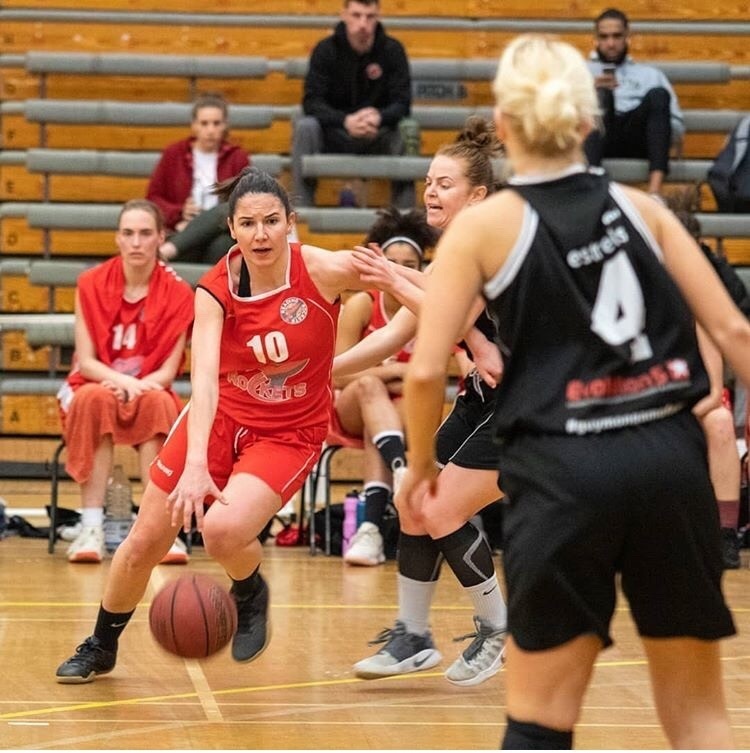 Despite this impact Rockets Ladies tried fervently to take the victory but just one of three treble efforts hit the target and Riders hit three from the free throw line to move into the semi-final stage. Four of Rockets Ladies had scored double figures compared to just the pair from the Riders professional WBBL team as Rockets fought tirelessly giving a great performance. Riders had made three blocks inside the opening three minutes as Rockets just couldn’t break through the tough defence , finding themselves on the receiving end of a 12-2 Riders run. Rockets captain Maike Delow Fasbender stopped the rot and Noa Sanchez Marques made a pair of steals and finishes before Monica Herranz De Antonio was secure from the penalty stipe as Rockets returned the 12-2 compliment and the scores levelled on 14 apiece. Five unanswered Riders points saw them enjoy a narrow 19-14 advantage at the end of the period. Andrea Gomez De La Vara stroked the first of her three trebles and Herranz hit one too to stay close to Riders at 20-26. Sanchez Marques caused Riders into a five second inbound violation as Rockets ramped up the pressure but nothing seemed to be going Rockets way as they found themselves 26-37 down at the interval. Head Coach David Sanchez was expecting a fresh upturn in pressure from Riders and quickly Rockets found themselves 42-28 and then 48-32 in arrears as Riders struck a brace of trebles, one on the buzzer. Nonetheless this Rockets Ladies team wears the badge with pride and great team work and ethics shone through as they recovered to 43-48 moments before the last break though Riders went into the last period 50-43 ahead. Rockets scored off their first possession to close the gap and then made a pair of stops but Riders stroked a treble. Sanchez Marques scored and Herranz De Antonio made a big rejection as the travelling Rockets fans bellowed their encouragement. Another Gomez De La Vara treble saw Rockets just two scores behind at 53-59 with two minutes remaining and Rockets in the ascendancy and causing this smart Riders team many problems they hadn’t envisaged after their early dominance. Then the decision that fuelled up Rockets through losing their stalwart player as Rockets did their upmost to take the win though losing out narrowly 58-63. 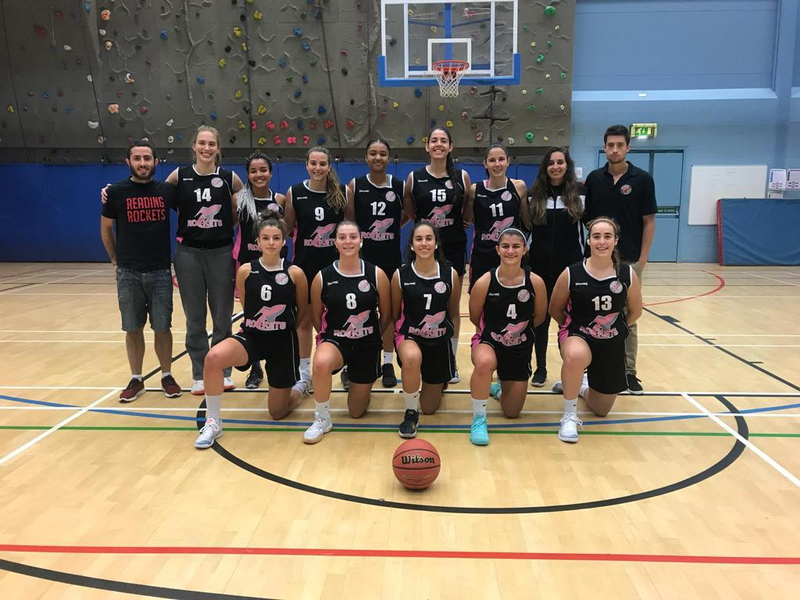 Top scorers for Rockets were Monica Herranz with 13 points, 6 rebounds, 3 assists and 2 steals accompanied by Andrea Gomez with 13 points, Noa Sanchez with 11 points, 4 rebounds, 4 assists and 3 steals and Anabel Latorre Ciria with a double double of 10 points and 15 rebounds.